Summer is here in full-swing and you’re probably thinking about finally tackling those home improvement projects you’ve been putting off. Maybe you want to repair that leaky faucet or re-paint your living room or exterior. How about replacing that old, worn-out fence in your yard while you’re at it? You may be tempted to do it yourself, but as a professional fence installation company, we often see do-it-yourselfers making a wide variety of mistakes during the process. If you want a stress-free, mistake-free, beautiful fence installation job done, look no further than Hercules Fence of Richmond. Check out these common residential fence mistakes so you can ensure that they don’t happen to you! Check out these common residential fence mistakes so you can ensure that they don’t happen to you! If you’re installing your new fence during summer weather, it’s easy to forget that it will eventually have to be exposed to all the elements including rain, snow, and cold. 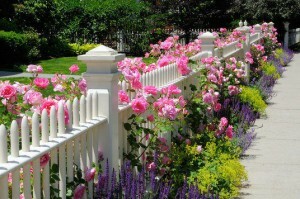 Hercules Fence can help you to select the material that is right for your property. One of the most awkward and embarrassing residential fence mistakes is allowing your new fence to encroach on the property of others. Know where your property line ends and someone else’s begins to avoid paying fines or going to court over your mistake. Almost no one’s yard is completely flat. When installing a new fence, you’ll have to account for the slopes and hills. The average homeowner simply does not have the skills or tools to adjust the fence to compensate for inclines and declines and as a result, their fence is not uniform. Your fence is only as strong as its anchor points. If you fail to install it at the proper depth or use the wrong types of materials, your fence will almost certainly become unstable or fall down, especially in sub-zero temperatures. A general rule is the more attractive the fence is, the more difficult it is to properly build. Often, homeowners want the beautiful look without the price of a professional, so they try to install it themselves. Unfortunately, this often leads to the fence not being able to perform its functions – gates don’t latch, the posts don’t line up, or it’s structurally unstable meaning that kids and pets can easily escape. This entry was posted on Friday, July 31st, 2015 at 4:03 pm. Both comments and pings are currently closed.